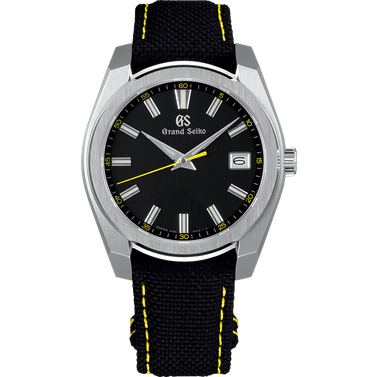 Caliber 9F redefines the quartz watch, delivering higher performance and greater durability. It is the quartz watch that merits the name Grand Seiko. 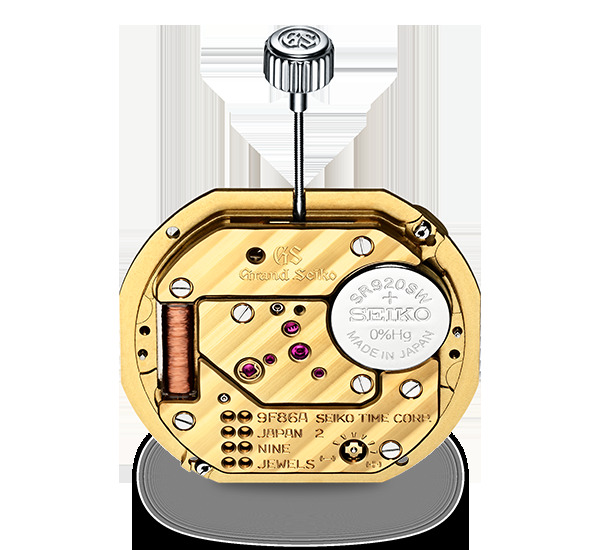 A quartz movement depends on a battery as a power source. The battery sends electricity to a quartz oscillator, which vibrates at precisely 32,768 times per second. An integrated circuit (IC) detects these vibrations and sends out an accurate time signal every second to the step motor. The step motor activates in accordance with this time signal, accurately rotating a series of gears and the watch hands. Changing the date display in the blink of an eye. The 9F quartz movement utilizes a cam and lever in conjunction with the date indicator driving wheel as part of a feature known as the Instant Date Change Mechanism. Through this mechanism, the date indicator driving wheel builds tension in the lever spring as it rotates, eventually releasing the stored energy when it reaches the location of the cam and driving the calendar wheel forward in the blink of an eye. While some mechanical movements possess enough torque to deliver instant date changes, Grand Seiko was the first to pioneer the mechanism in a quartz movement. The task of aligning the Instant Date Change Mechanism to occur precisely at midnight falls upon Seiko's skilled craftsmen, who painstakingly set the mechanism by hand. In order to ensure that there is no situation in which the change occurs prematurely, the mechanism is set to activate within five minutes after midnight. 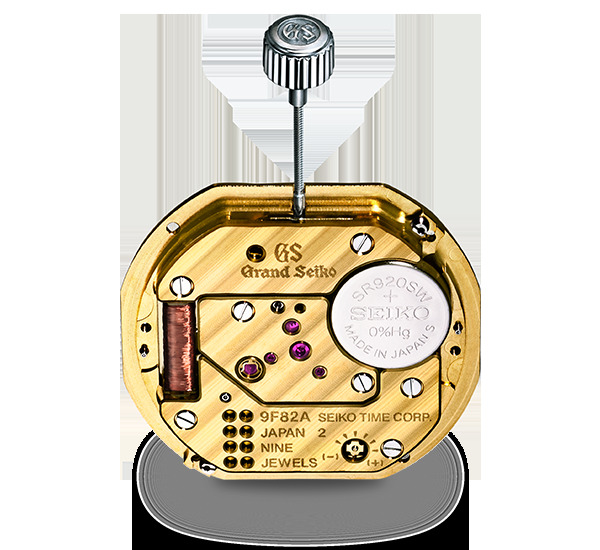 While the majority of the world's quartz movements are products of automatic assembly, Grand Seiko's 9F quartz movement, with its variety of complex functions, is assembled entirely by hand. Two expert craftsmen combine their individual talents to preserve the high quality standard of Grand Seiko – with one assembling the date indicator and the other in charge of the movement. Once the movement is assembled, the dial, markers and hands are attached and the entire movement installed into the case. Attaching the watch hands is perhaps one of the most delicate and precise procedures requiring the supreme skill of an experienced craftsman or woman. The hour and minute hands are stacked in parallel within a space of just 2mm and fixed in place with the movement axis by frictional force. Only an expert in adjustment can ensure that all hands, a mere 0.2mm apart, operate smoothly without colliding with one another as they rotate. In order to ensure that no damage is wrought to the hands during assembly, craftsmen polish the tips of their pincers multiple times every day. It is the cumulative efforts of these painstaking details which have raised Grand Seiko to become the standard bearer it is today. Unable to match the high torque of mechanical watches, quartz watches generally make use of lighter and thinner watch hands. 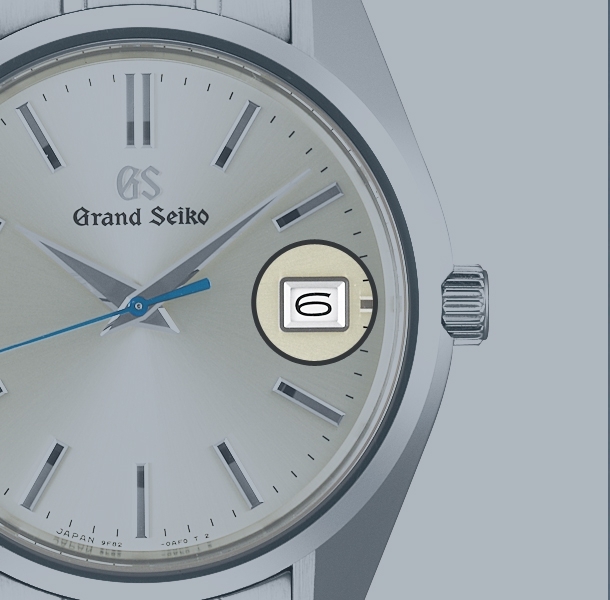 Grand Seiko quartz models defy this limitation, bearing the same broad hand design as on every Grand Seiko watch. 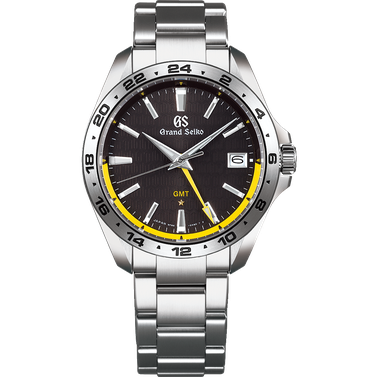 The 9F quartz caliber makes this possible through its Twin Pulse Control Motor, a system capable of turning longer and heavier hands while preserving battery power. In a normal quartz movement, the second hand moves in a single step from one second to the next. In the 9F quartz movement, the second hand instead makes two consecutive steps per second, triggered by two successive pulse signals. Increasing the number of pulse signals augments the output torque from the rotor, enabling the use of heavier hour, minute, and second hands. This two-step process is undetectable by the naked eye and appears as a single step no different from standard quartz timepieces. A low-power IC allows temperature control and extended battery life. The 9F quartz movement goes beyond the quartz standard in temperature control as well, with an extremely low-power temperature correction system. Most standard quartz watches do not employ a temperature control program. Because a significant amount of electrical power is required to operate a temperature control system, quartz watches utilizing the technology face a trade off in battery life. The extremely low power consumption of the temperature control system used in the 9F quartz movement successfully solves this problem. Combined with the low-drain Twin-Pulse Control System for the hands, this temperature control system allows a battery life of three years. Watch hands are driven by a series of gears, and there is always a certain amount of play, or backlash, between the teeth that engage each wheel with the next. Although this backlash allows the gears to rotate smoothly, it is also responsible for the slight shuddering of the second hand, an imprecision that was unacceptable to the Grand Seiko designers. To address this, a unique method to enable the precise second hand movement known as the Backlash Auto-Adjust Mechanism was developed. The mechanism makes use of a hairspring, a core component of mechanical watches. By utilizing the slight spring power afforded by the hairspring, the faint shuddering of the second hand can be stabilized so that the second hand advances precisely and with no shudder. Inadvertent interference between the hour or minute hands and the second hand can occur during time adjustments, causing slight shaking in the thinner second hand. 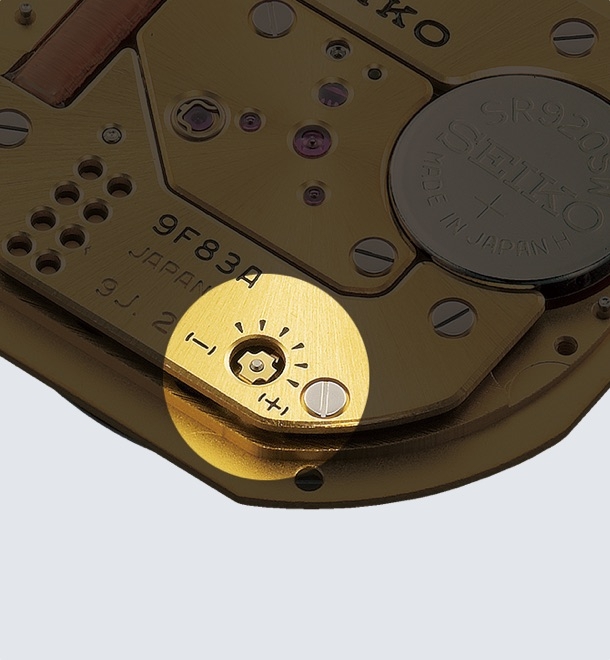 Because even the slightest shudder is incompatible with the standards of Grand Seiko, engineers developed a solution known as the Independent Axis Structure to prevent this problem. A watch’s second hand travels around the dial 1,440 times every day while the minute hand completes 24 revolutions. Precise time can only be correctly displayed if there is no interference between these rotating parts. In the 9F quartz movement, the axis of each hand is allowed to move independently, preventing the hands from brushing each other, eliminating twitching when the time is adjusted, and facilitating smooth and precise movement. 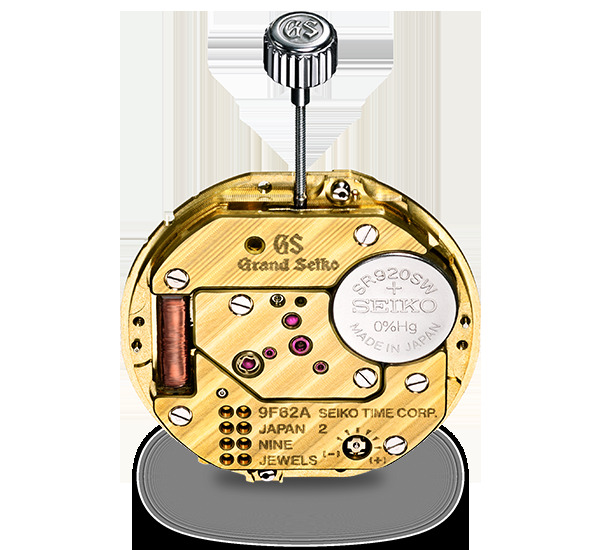 The movement of the crown is another unique facet of the 9F quartz movement. In standard quartz watches, one full rotation of the crown moves the minute hand the equivalent of 60 minutes. The 9F quartz movement reduces this equivalency to 20 minutes, making it possible to adjust the time with even greater precision. The crown itself is also more prominent, with a thickness of 11mm, which ensures that operational mistakes are avoided when switching to the date display. While mechanical watches possess a mechanism for fine tuning precision, these controls are impossible in most quartz watches. The 9F quartz movement, however, features a regulation switch that makes such precision control possible. If, because of environmental conditions or other factors, a watch ever becomes too fast or slow, the switch can be used to correct for such divergences. Owners who come to intimately know the individual tendencies of their watch over the years can quickly adjust the accuracy and continue to use it for years to come. Given the superb inherent accuracy of the 9F quartz movement, however, most will never need to know this adjustment function even exists. This is true to the high standards of Grand Seiko. 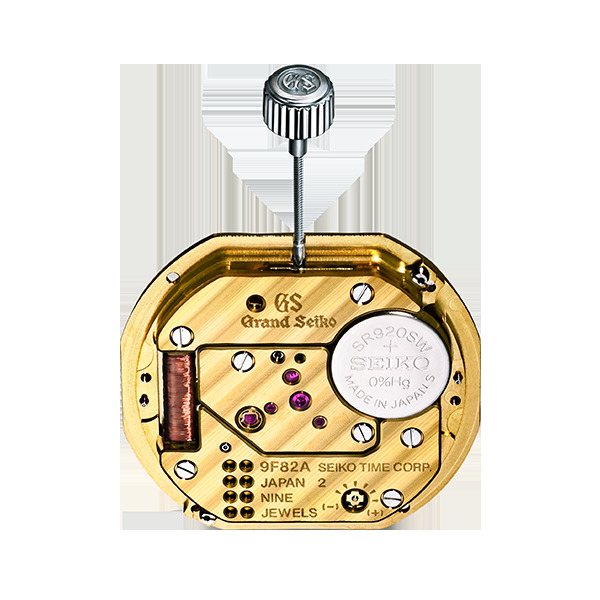 Grand Seiko developed its Super Sealed Cabin to ensure that the rotor, the heart of the quartz movement, is encased in a highly airtight environment. This structure prevents dust from entering delicate parts of the movement when the battery is changed and ensures that the lubricating oil reserve for the step motor pivot is sealed from the air, extending the life of the oil. The entire mechanism reflects a deep understanding of the precision of quartz movements and serves the purpose of preserving the long-term reliability and precision of the 9F caliber. The Super Sealed Cabin is designed to minimize the risk of harm when the case is opened for the battery changes that every quartz movement requires. The wall separating the battery from the gear train to avoid the introduction of foreign particles even contains a peephole studded with a ruby for observation during battery changes. Caliber 9F delivers an exceptional precision rate of ±10 seconds per year. This is made possible by the selection of highly stable quartz crystals that are put through a rigorous aging process. The accuracy of a quartz watch depends on whether the quartz oscillator can maintain a precise rate of 32,768 oscillations per second. Despite the overall regularity of this oscillation, each quartz oscillator has different performance characteristics, with some unable to maintain stable performance during the course of long use and changes in the environment. Yet other oscillators may perform with high precision at first, but undergo change in their oscillation over the years leading to inaccuracy. Recognizing this, Seiko introduced its aging process of crystal selection to ensure that the oscillators stabilize before being used. 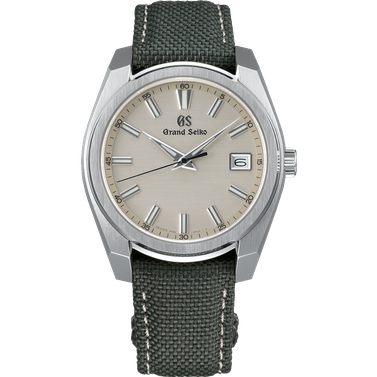 Grand Seiko was the first in the world to utilize quartz oscillators selected through this process. As part of the process, quartz oscillators made in-house are first 'aged' for three months, during which they are subjected to certain voltages so that their characteristics stabilize. Only then are they tested and selected, and only quartz oscillators that meet strict standards are used in the 9F quartz movement. Quartz oscillators are susceptible to temperature changes. The rate of 32,768 oscillations per second fluctuates with changes in ambient temperature. If this rate changes by even a single vibration per second, accuracy can fall by as much as 16 minutes a year. To solve this problem, information on the individual characteristics of an oscillator is stored beforehand in the IC. By matching each oscillator with its own individually set IC in this way, 9Fmovements can operate perfectly. Beyond this, the temperature inside the watch is also measured 540 times a day. The temperature data is transferred to and processed by the IC, which compensates for any deviation that would be detrimental to preserving high accuracy. 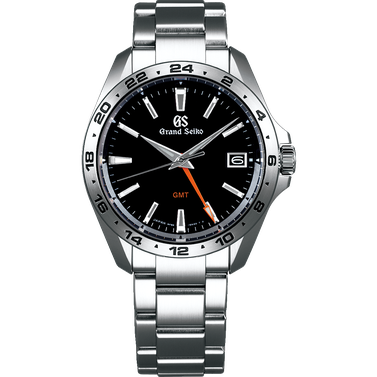 Grand Seiko began its long history in 1960 with mechanical watches. In 1988, the first quartz Grand Seiko model was born, with a powerful movement with an accuracy rate of ±10 seconds a year. 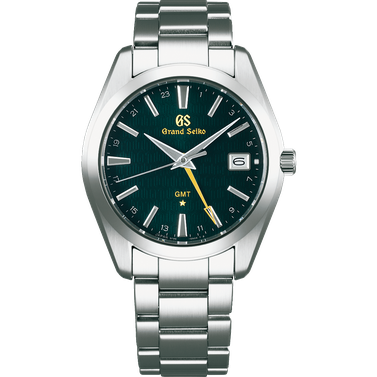 In 1993, Grand Seiko achieved a new standard in quartz watches with the release of the 9F8 series which incorporated new features including the Backlash Auto-Adjust Mechanism, the Twin Pulse Control Motor, and the Instant Date Change Mechanism.